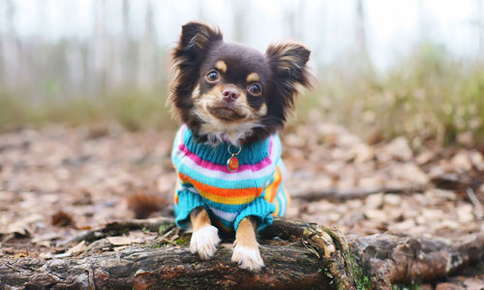 There is nothing cuter than a pet in a colorful sweater, but do our furry friends really need to wear clothing? Although clothing is not a necessity for every pet, some animals benefit from a little extra protection during cold or damp days. Others enjoy wearing festive clothing during holidays or other special occasions. No matter what the reason, it's important to ensure that the clothes you buy your pet are comfortable and safe. Pajamas are a good choice if you notice your pet shivering during cold winter nights. Older pets, hairless pets, pets with close-cropped hair and small breeds, such as Chihuahuas, may also prefer to wear pajamas during the day if the house is particularly chilly. Unlike pajamas made for humans, pet pajamas do not include pants for obvious reasons. Booties protect your pet's feet from developing frostbite, cracked pads, and burns from salt used to de-ice sidewalks and streets. Velcro straps attach the booties to your pet's feet, and grips on the bottom help reduce slipping during icy days. A raincoat is a good addition to your pet's wardrobe if you live in a particularly rainy climate or your furry friend enjoys long walks on rainy days. Raincoats also provide protection from sleet during winter walks. Fleece-lined varieties keep your pet both warm and dry. Whether you want to dress up your pet for Halloween, Christmas or another occasion, you will find a large selection of styles sure to make a statement. Make sure special occasion clothing does not contain zippers, strings, buttons, or other items that can be chewed off and swallowed. Collars and Leashes. Collars and leashes are available in a variety of colors, patterns, and designs. Match the collar to the leash or choose complementary colors and designs. Colorful harnesses are also available for your cat or small dog. Glow-in-the-Dark Collars. These collars help your dog or cat stand out when the sun starts to drop and also help you avoid tripping over your pet when you sneak down to the kitchen for a middle-of-the-night snack. Friendship Collars/Bracelets. Matching friendship collars and bracelets (for you) offer the perfect way to show the world that you and your pet are a team. The collars and bracelets are designed to fits dogs, cats, and their human companions. Bandanas. Bandanas are a must-have accessory for many dogs. Although jaunty, bandanas are perfect for everyday wear. They also offer a fun way for your pet to observe a holiday or birthday, or show support for your favorite sports team. Your pet may resist wearing clothing at first. It's best to introduce a new item of clothing gradually. Start by placing the sweater, pajamas, or booties on your pet for a few minutes at a time, then gradually increase the amount of time your pet wears the clothing. Some pets will never adjust to wearing clothing. If wearing a Halloween costume or donning a raincoat stresses out your dog or cat, clothing may not be the best choice for your pet. Breeds with thick hair or breeds bred for colder temperatures do not need to wear clothing. For example, Siberian huskies were bred to live in the harsh climate of northeastern Siberia and can handle cold temperatures without a problem, although they can benefit from wearing booties to protect their feet from salt and slippery conditions. Pets can become overheated when wearing clothing, particularly if the temperature begins to rise or if they are very active during a walk. If your pet begins to pant while wearing a sweater or pajamas, remove the item immediately. Before you add clothing to your cold pet’s routine, be sure to get the vet’s ok that your pet’s discomfort is not being caused by an underlying medical issue. Give us a call if you’d like to set an appointment to discuss the best ways to keep your furry friend comfortable, warm, and healthy no matter what the season. Pet360: Weather or Not: Should Dogs Wear Clothes?